STEM Revolution’s Alison Lark, Derica Preble, and Sonja Jacobson attended the Idaho Technology Council’s (ITC) Hall of Fame event the evening of October 24, 2017. The ITC Hall of Fame event inducts community members into its Hall of Fame, honors the INDEEDS Award Winners, as well as, features the Idaho Innovation Awards. In 2015, STEM Revolution’s founder Lorna Finman was honored with the Innovator of the Year award and the company has attended the event ever since. In line with the Idaho Technology Council’s mission to help companies in Idaho start, grow, and thrive by bringing together industry, education, research, investment, and government throughout the state, the event was attended by representatives from Idaho companies, teachers, and government officials. The team greatly enjoyed reconnecting with the previous Innovator of the Year winner The Shoe That Grows and this year’s winner (Spoiler Alert) TSheets. The evening began with honoring teacher’s in the Idaho community. Payette teacher Paula McElroy and Caldwell teacher Jason George were named the 2017 winners of the Industry’s Excellent Educators Dedicated to STEM (INDEEDS) Award. These teachers were recognized for their commitment to championing STEM education, connecting students with industry leaders to mentor projects, and providing invaluable career guidance. STEM Revolution has had the pleasure of working with past INDEEDS Award winners Kellie Taylor and Amber McVey to further STEM education in its summer camps, student workshops, and teacher training programs. The keynote speaker for the evening was former astronaut and current SpaceX innovator, Garrett Reisman. He gave a humorous presentation honoring the Hall of Fame Inductees, Barbara Morgan and Burt Rutan, as well as, sharing his experiences as an astronaut and pioneering America’s future in space as the Director of Space Operations for SpaceX. The ITC event also inducted two new members into its Hall of Fame. This years inductees were Barbara Morgan and Burt Rutan. Barbara Morgan was an elementary school teacher for 11 years, the first American school teacher in space, a Distinguished Educator in Residence at Boise State University, and a mentor for students and STEM education programs. Her accomplishments have earned her numerous accolades including the Challenger Center President George H.W. 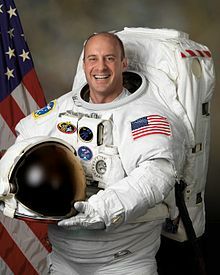 Bush Award, the Adler Planetarium Women in Space Science Award, the USA Today Citizen of the Year, and the prestigious Idaho Medal of Achievement. STEM Revolution has teamed up with Morgan in the past, supporting Zero Robotics in the Boise community. The second Hall of Fame inductee this year was Burt Rutan. Burt Rutan is a retired aerospace engineer who is known for designing the first privately built spacecraft, the SpaceShip One for Virgin Galactic. Rutan has designed 46 aircrafts throughout his career, winning more than 100 awards for aerospace design and development. Rutan is described by Newsweek as “the man responsible for more innovations in modern aviation than any living engineer.” STEM Revolution’s Founder, Lorna Finman, has had the pleasure of working with Rutan to establish the Da Vinci Cube Satellite program at the North Idaho STEM Academy, making it 1 of the 20 schools selected by Nasa to launch a satellite into space. It was a wonderful evening and STEM Revolution is proud to be a part of a community that promotes and celebrates innovation.